What if immunotherapy was the solution to cure Alzheimer’s disease? Despite the recent failure of the monoclonal antibody solanezumab to meet primary endpoints in two Phase III trials, its contribution to the development of passive immunization has brought new hope to patients suffering from Alzheimer’s disease (AD). AD represents a major health issue as it affects an increasing number of people each year. This incurable neurodegenerative disease mostly concerns elderly people but not only: a familiar early-onset form also affects younger people. In both cases, it is characterized by a progressive dementia leading to a loss of autonomy and death. Some of its mechanisms have been well identified, but it still remains impossible to determine with certainty which are the causes leading to the onset and development of the disease. According to the “amyloid-beta cascade hypothesis”, AD finds its origins in a cellular dysfunction leading to the development and accumulation of senile plaques in the brain, composed of the amyloid β peptide (Aβ). According to the “Tau hypothesis”, the primary upstream event is an intraneuronal accumulation of neurofibrillary tangles. Both phenomena are observed in AD patients, as well as cholinergic neuron damages, oxidative stress, and inflammatory reactions. All these pathologic expressions are obviously linked to each other, but it is rather complicated to determine the chicken and egg within the global AD process. This makes the finding of an efficient treatment particularly difficult. Until recently, the only existing therapeutics were symptomatic and very little research was conducted to find out curative treatments. Anticipation of the first symptoms: Most of the AD clinical symptoms appear more than a decade after the development of the first internal signs of the disease. This leads to very late detection of AD, which might explain the inefficiency of current treatments. To counterpart this, studies are conducted in order to improve diagnosis by developing new biomarkers and technologies to detect its early signs. More and more studies are also conducted on the predictable familiar forms of AD to find out if an earlier treatment could prevent the initiation or expansion of the disease. Increasing the uptake of antibodies to the brain: Only a small proportion of the injected antibodies are able reach the brain, due to the presence of the BBB (blood brain barrier) which prevents big molecules from reaching the brain. The discovery of the recombinant antibody production method lead to the generation of new antibody formats, such as bispecific antibodies and antibody drug conjugates, that possess the ability to overcome the low BBB permeability. Generation of microbubbles via focused ultrasound (FUS) is also envisaged to allow biotherapeutic penetration into the CNS through the BBB. Prevention of side effects: Bapineuzumab trials were aborted because of their severe side effects, including vasogenic edema and microhemorrhages resulting from the activation of antibody’s effector function. AAB-003, a bapineuzumab alternative with a modified Fc receptor was designed to avoid these side effects but was also aborted as it could not bring significant improvements. Another way to prevent the development of side effects could be a slower and more progressive increase in the dose administration. Exploration of new paths: The recent failures of Aβ targeting drugs have forced pharma and biotech companies to consider exploring new pathways. Thus, an increasing number of Tau fibril-targeted antibodies are reaching early clinical phases. 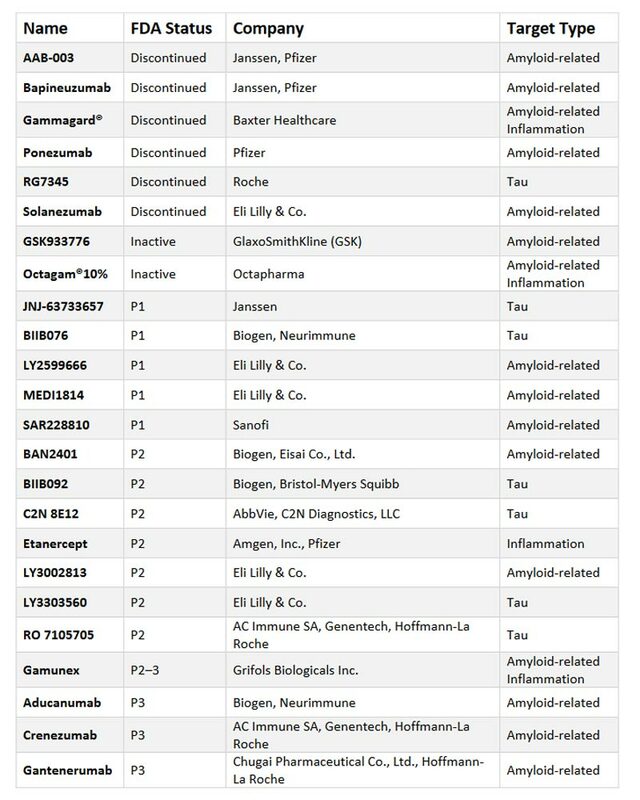 It concerns 6 of the 12 therapeutic antibodies currently tested on first and second phases of clinical trials (Table 1). Incoming studies are also focusing on antibodies targeting both Aβ and Tau pathology thanks to their similar abnormal oligomer form. The search for a therapy against AD is uncertain and has resulted in many failures. Nevertheless, we can hope that the fast-growing advances in biotechnologies could lead to an improvement in diagnostics and a better understanding of the disease. The emergence of new research directions in the preclinical and clinical phases is very promising. The great effects obtained in animals with passive immunotherapy suggest that this technique could be a serious key leading to a curative treatment. The remaining challenge is finding a way to obtain the same encouraging results in humans. Aisen, P.S., and Vellas, B. (2013). Passive immunotherapy for Alzheimer’s disease: What have we learned, and where are we headed? J. Nutr. Health Aging 17, 49–50. Beck, A., Wurch, T., Bailly, C., and Corvaia, N. (2010). Strategies and challenges for the next generation of therapeutic antibodies. Nat. Rev. Immunol. 10, 345–352. Cappa, S.F. (2018). The Quest for an Alzheimer Therapy. Front. Neurol. 9. Du, X., Wang, X., and Geng, M. (2018). Alzheimer’s disease hypothesis and related therapies. Transl. Neurodegener. 7. Kametani, F., and Hasegawa, M. (2018). Reconsideration of Amyloid Hypothesis and Tau Hypothesis in Alzheimer’s Disease. Front. Neurosci. 12. Schilling, S., Rahfeld, J.-U., Lues, I., and Lemere, C. (2018). Passive Aβ Immunotherapy: Current Achievements and Future Perspectives. Molecules 23, 1068. Spencer, B., and Masliah, E. (2014). Immunotherapy for Alzheimer’s disease: past, present and future. Front. Aging Neurosci. 6. Tarawneh, R., and Holtzman, D. (2009). Critical Issues for Successful Immunotherapy in Alzheimer’s Disease: Development of Biomarkers and Methods for Early Detection and Intervention. CNS Neurol. Disord. - Drug Targets 8, 144–159. Wisniewski, T., and Goñi, F. (2014). Immunotherapy for Alzheimer’s disease. Biochem. Pharmacol. 88, 499–507.